Chinese Press Release Writing and Publishing in People's Daily and more! 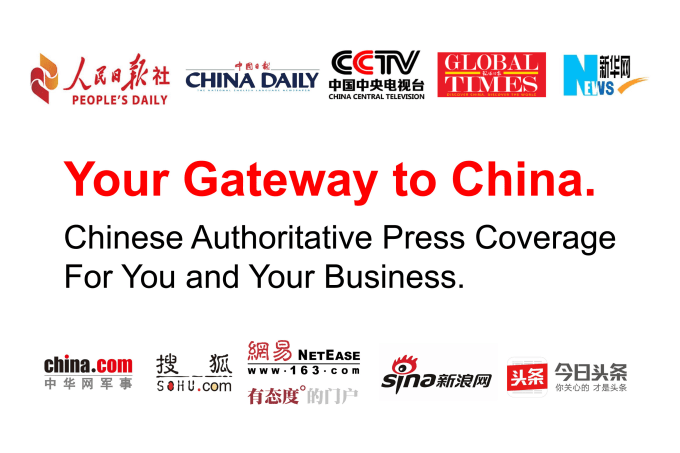 Get Chinese Authoritative Media Coverage! We are your gateway to China, one of the largest and fastest-growing economies in the world. This is NOT just a press release distribution service. Your article will appear just like any other real “news” on the site and could be viewed by millions of people in China. Chinese media (even the largest People’s Daily group) have a long tradition that allows individuals and companies to pay to have their news article published on their site. However, foreigners may find it difficult to access such service due to language barriers. We are a marketing agency in Hong Kong with widespread connections with Chinese media and we can help you publish your news on all major Chinese media sites. Contact us if you would like to publish in any particular one or we can suggest the best one for you. As the Chinese regulations are ever-changing, we cannot guarantee the availability of any particular media. Articles have to be perfectly written in Simplified Chinese. We can provide professional writing or English translation service. Get in touch with us today and get your product/brand/achievements covered on authoritative media in China! What are some good topics of the article? Good topics include new product release, a new milestone reached, any award you received, or any other newsworthy topics. Are there any limitations on the industry of the topic? No, but some industries tend to be more difficult to be approved, such as medical, coal, energy, banking, etc. Are there any word limitations on the article? No, there is no words limitation. You can write something from few hundreds to few thousands Chinese words. Yes, you can include up to 3 pictures with captions on most sites. Some more authoritative sites allow only 1 picture. But still, you are recommended to include more pictures for the media’s editor to choose the appropriate ones. Can I include any website links or contact information in the article? No, you cannot include any website links or any contact information in the article. But you can mention your brand or name in the article so that people can search for you.